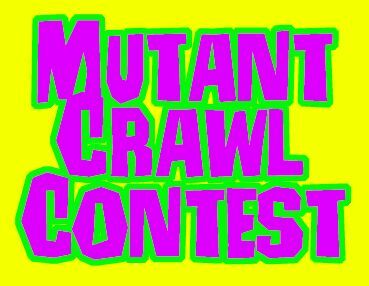 The Sanctum Secorum now has a third party license for Mutant Crawl Classics and that means it is time for us to do something MCC RPG Specific. Announcing…. 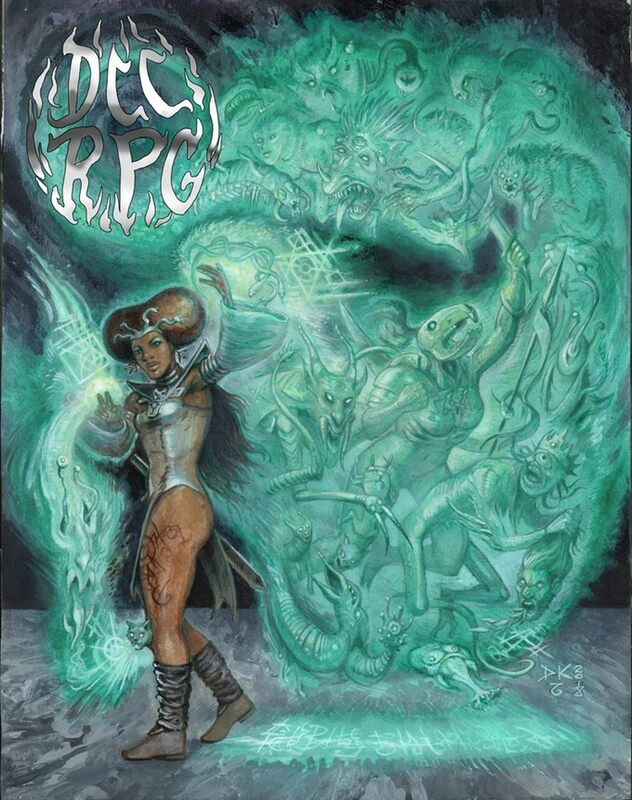 There is an amazing array of DCC/MCC and related materials currently up on kickstarter. At the time of writing, ALL of these projects have already met their funding goals and are into stretch goal territory. Here is your quick roundup. Check This Artifact – Funds Mon, March 4 2019 9:00 AM EST. Billed as “more deadly artifacts for your mutant crawling game”, this work from Jim Wampler contains 30 new artifacts and a new A.I. for use with MCC or other post-apocalyptic games. For Glory #1 – Funds Thu, March 21 2019 1:03 PM EDT. AKA the Hexonomicon, is billed as a setting generator. This looks like it could be really handy for folks getting started with “sandboxing”. Of course, the smell of dittos carries its own nostalgic power. Ghostlike Crime – Funds Wed, March 13 2019 12:01 PM EDT. Using DCC mechanics, this game sets players against cryptids, serial killers, hidden cabals, and paranormal threats in a world that is both familiar and yet strange. This looks to be great fun. 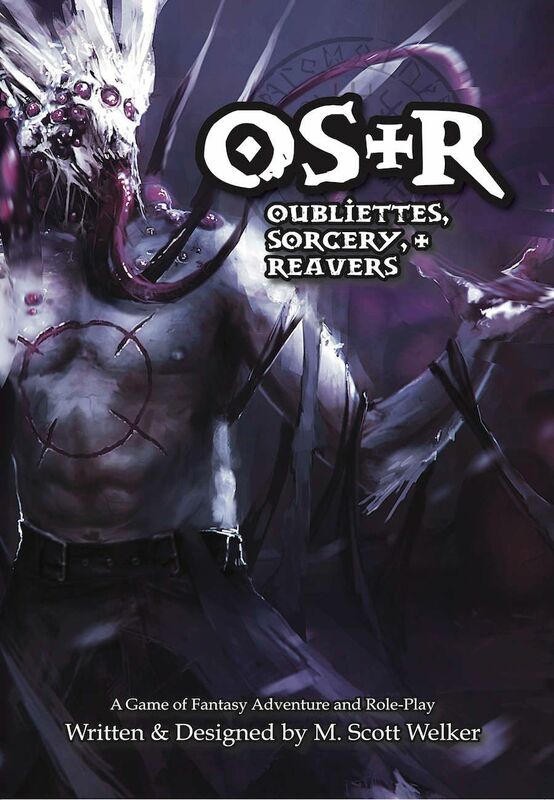 The Lesser Key to the Celestial Legion – Funds Thu, February 28 2019 12:00 AM EST. Donn Stroud (co-host of Drink, Spin, Run and contributor to Metal Gods of Ur-Hadad) and James A Pozenel jr. (author of Angels, Daemons & Beings Between, vol. 2: Elfland Edition) are collaborating to bring greater depth to the religious side of your DCC table. Generating divine messages, religious observances, and a lot more get coverage here. For those who want more depth to DCC Clerics? This is your guide. Terror of the Stratosfiend – Funds Sun, March 17 2019 12:20 PM EDT. Quite possibly the most over the top, “gonzo” setting we’ve seen for DCC. This looks like it will be great fun. Our need for this product is summed up in two words, “laser chainsaws”. What Happened at Wyvern Rock? – Funds Sun, March 3 2019 7:36 AM EST. While not DCC specific, this system neutral zine is meant to introduce “High Strangeness” (aka Swords & Saucery) to your campaign. Aliens, strange livestock behaviors, and more are explored as tools to keep your players guessing, and their characters a little uneasy. 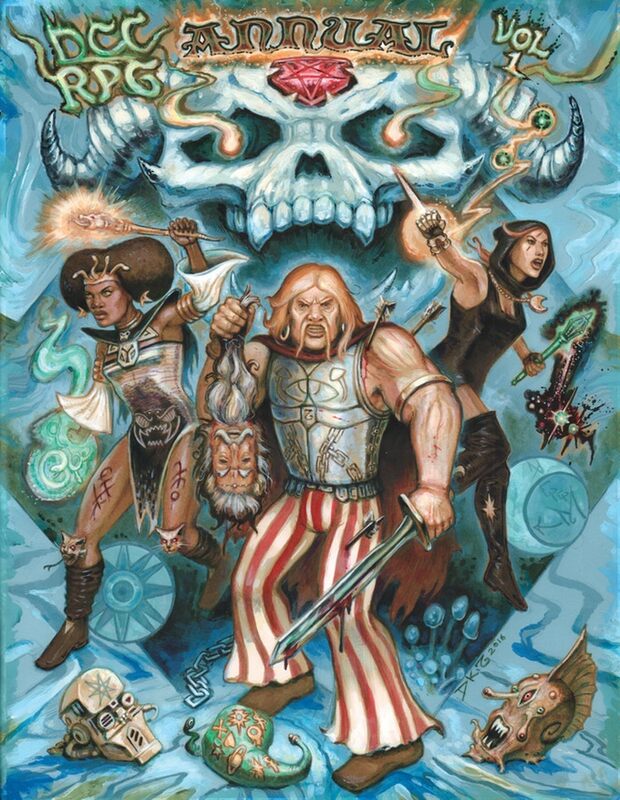 Goodman Ga mes is running a multifaceted Kickstarter to fund the DCC Annual, a hardcover reprint of the Chained Coffin, and the 7th printing of DCC RPG. There is a LOT of amazing goodness in there . So much art, so much content. We could give you all the details but … that is what the Kickstarter page itself is for! Three weeks remain until the end of crowdfunding and we know that Goodman Games always has some amazing late in the game stretch goals. We cannot wait to see what comes next! The new Kickstarter for Bears Want to Kill You has already surpassed its funding requirement and is to its final 3 days ( Fri, May 18 2018 3:02 AM EDT ). One last stretch goal remains, a slipcase for the hardcover edition! If there is one thing that we DCC folks go crazy for, it is slipcases! Let’s try to make this happen! Eisner Award winning Artist Ethan Nicolle is a friend of the show, and graciously allows us to use his artistic creations and stat up the mayhem inducing horrors for DCC. Just because he’s nice. Seriously. So let’s return that love and support his book of ursine mayhem! So, we continue to build on our partnership with Axe Cop co-creator Ethan Nicolle in an effort to warn of the impending bearmageddon as well as bring nightmarish inspiration to your DCC table. 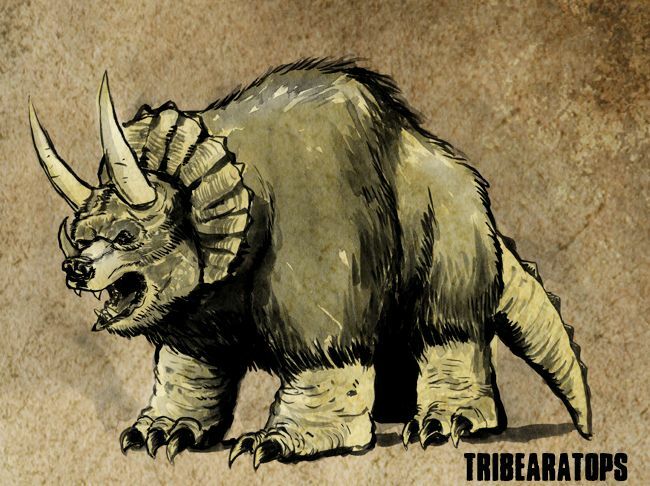 Created by the mad wizard Ethcolle, the tribearatops is an absolute horror of fur and scales. A force of utter devastation, the tribearatops rivals dragons for sheer destructive power. It is thus quite fortunate that the creature is also slow moving – as entire villages have been known to literally relocate their structures out of the monsters path. Tribearatops: Init +0; Atk bite +6 melee (3d6), gore +8 melee (2d12 + poison), stomp +4 melee (3d10), or tail sweep +10 melee (1d16 + DC 20 Reflex or knocked prone); AC 35; HD 10d14; MV 20’; Act 2d24; SP dragon crits, long tail, maternal, poison, vulnerable spot (AC 18); SV Fort +8, Ref +6, Will +3; AL C.
Long tail: The tribearatops’ tail is long enough that, on a successful hit, additional targets within 5′ must make a Reflex save vs. 15 or also be struck prone. Maternal: The normally slow moving creature enters a frenzy should its young be threatened, doubling both its Move and number of attacks. Poison: Tribearatops horns are coated with naturally occurring Oxytocin. Merely coming into contact with the horn requires a DC 15 Fort save while being impaled by the horn increases the DC to 20. Failure results in the victim being overwhelmed by emotion and leaping onto the horn and killing themselves in sacrifice. Vulnerable spot: There is a single vulnerable spot on the beast which may be successfully targeted with a precision shot Mighty Deed with a result of 6+. Tribearatops (both art and concept) are the creation of Axe Cop co-creator Ethan Nicolle (@axecop) and is used with his kind permission. These, and a slew of other ursine horrors can be found in the pages of Bearmageddon as well as within Dickinson Killdeer’s Guide to Bears of the Apocalypse. Here is a sampling of where you can find DCC Road Crew Judges on Free RPG day. This list is a constant work in progress during the days leading up to Free RPG day so send us your info (via email or Google+) and we will add you to our list! 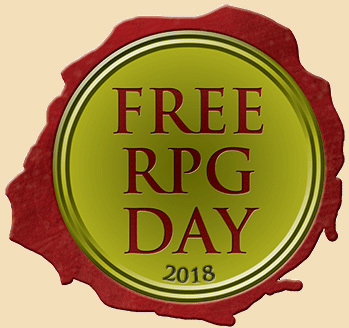 Note that venues in green have Judges who will be handing out the 2018 Sanctum Secorum Free RPG Day Companion. The product itself is fairly sharp. Art styles vary a bit wildly for my particular taste, but overall, it is a nice looking PDF. When looking at its usefulness for adaptation to DCC? There is some GREAT stuff in here. A few familiar faces are up for ENnies this year. Not many….but here is your brief guide to DCC at the ENnies.